GIRLS from St Bernard’s Primary School, Upper Mt Gravatt, are designing an app to boost self-esteem in young girls after discovering other girls in their school struggle with their appearances. Nine 11-year-old girls, who go by the coding team name Bernie Beetles, have spent nearly 12 weeks outside of school hours designing an app to combat low self-esteem in girls. The girls, who were coached by three school staff members, are planning to enter their app into the Tech Girls Superhero Competition, an Australian and New Zealand program for girls aged seven to 17. 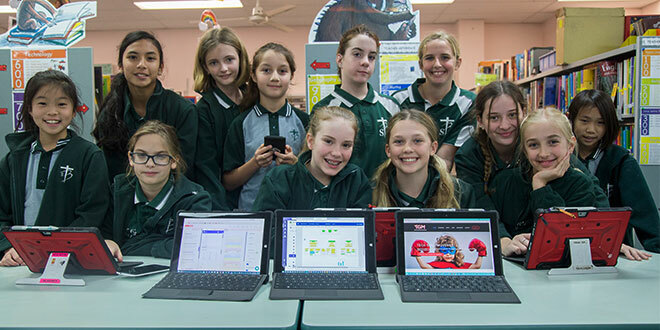 Another group of eight-year-old girls are also submitting an app addressing environmental issues with two students from the neighbouring Clairvaux MacKillop College, Upper Mount Gravatt, under the team, Code Monkeys. It is the first time girls from St Bernard’s have entered the competition, which challenges girls around the world to take their STEAM (Science Technology Engineering Arts Math) skills to the next level by creating an app to benefit society. Through a targeted survey, the Bernie Beetles discovered other girls from their school were facing pressures “to look thin”, struggled with their appearance or suffered from anxiety. St Bernard’s teacher and Bernie Beetles coach Vivienne Thompson said the girls’ app would provide young girls “with some strategies and activities to help address low self-esteem”. “The girls targeted this through offering a range of app activities – including recipes, meditation, aspirational quotes and games,” Ms Thompson said. As well as creating an app, the girls were also asked to submit a business plan, pitch, logo and jingle along with the final app, which will be available on Android. Ms Thompson said the app was created using the programs Thunkable and MIT App inventor. Code Monkeys team coach Samantha Khoo said their group created an app to encourage people to pick up litter. The app, titled LitTerly, incorporates a reward system that “allow users to take photos of litter they have picked up and they can then classify the litter”. The photos can be uploaded to the app to show the litter and their scores are published on a leaderboard within the program. All students in both teams have had the opportunity to develop their ideas with a professional mentor and have made plenty of progress with the design and production of their app. As part of the criteria in the competition, the app must align with one or more of the United Nations Development goals. Since 2009 more than 15,000 girls have participated from over 100 countries in the program. The Tech Girls Movement aims to promote gender equality and encourage women to get involved in technology. Bernie Beetles and Code Monkeys have until July 27 to submit their app to the competition, with judging occurring throughout August.